Because quilt fabric is usually lightweight, embroidered quilt squares are often puckered. To avoid puckers on your squares, fuse a piece of ShirtTailorÒ by PellonÒ to cover the entire back of your square. It will not be removed after embroidery. Rather, it adds body to the quilt square for the life of the quilt. Then, embroider using one or more layers of crisp tear-away stabilizer hooped in with the square. When you remove it from the hoop, remove the tearaway one layer at a time and your square is ready for use. But what is crisp tearaway? Simply put, it's the kind that is very easily removed. Soft tearaway is useful for some purposes, but it is the kind that I hear people refer to as being harder to remove. That's because it's made of both long and short fibers. 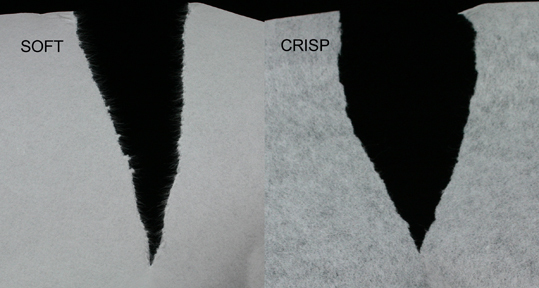 Crisp tearaway is made of only shirt fibers and tears more like paper. You can also use a sharp needle in your machine when embroidering quilt squares. Most of us use light ball-point needles most of the time. Even though light ball point needles are considered "universal" and can be used on a variety of fabric types, sharps penetrate woven materials more cleanly. Also, use a small blade size, such as a size 70/11 when embroidering quilt squares. If you follow these steps, I think you will be very pleased with your pucker-free quilt squares! Thank you for the idea. I have tried machine embroidery on a quilt square and used cut away. I thought what do I do when I wash the quilt? Don't want the wrinkles. I used stabilizer and my quilt block has puckers. How do you fix it????? Or can you? I was doing a Big Cat design and put 2 sheets of stablilizer behind it. It did help some but I still have puckers that I can not get out. An Easy Way to Keep the Dust Away! Embroidery Advisor Presents "Sweet Dreams"